Is Authoritarianism in the US the “New Normal”? How did Hall anticipate these trends? And what authoritarian expressions does he expect to see next? Watch Hall’s interview with Socionomics Institute staff below to find out more. 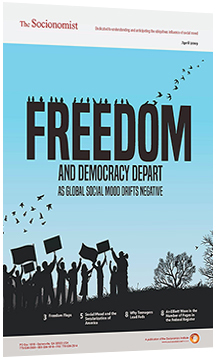 In the fifteen-page article, Hall examines ten authoritarian and anti-authoritarian trends – surrounding government surveillance, repressive authorities, Internet access, government entitlements, economic freedoms, court battles, terrorism, technology, whistle-blowers and public awareness.